Math Mammoth Grade 4 Worksheets - two reproducible math workbooks for 4th grade. Math Mammoth Grade 4 worksheets comprises two workbooks, 4-A and 4-B, covering all 4th grade topics. The worksheets have been created especially for teachers: each problem sheet is one page, concentrating on one topic. Each problem sheet in these two workbooks has been "hand-crafted". The problems both emphasize understanding of concepts and practice computation, with variable word problems. In essence, these problems are similar to what you'd find in a normal math book - not like the mechanical worksheets created by a script. In book 4-A, the first section of worksheets deals with addition and subtraction, place value, and money word problems including simple discount situations. The connection between addition/subtraction is emphasized extensively in these sheets. Several worksheets deal with missing addend problems that are solved with subtraction, also introducing equations of the type x + 100 = 200. The section on multiplication first briefly reviews the multiplication concept and multiplication tables. Then the main focus is on using partial products with mental multiplication, and on the multiplication algorithm up to multiplying 3-digit numbers by 2-digit numbers. There are also lots of opportunities for estimation, and for practicing order of the operations. Love e-books, they can be downloaded, then I run and copy the pages/worksheets as I need them! Measuring worksheets deal with both customary and metric system measuring, and also include some easy conversion problems between the units. 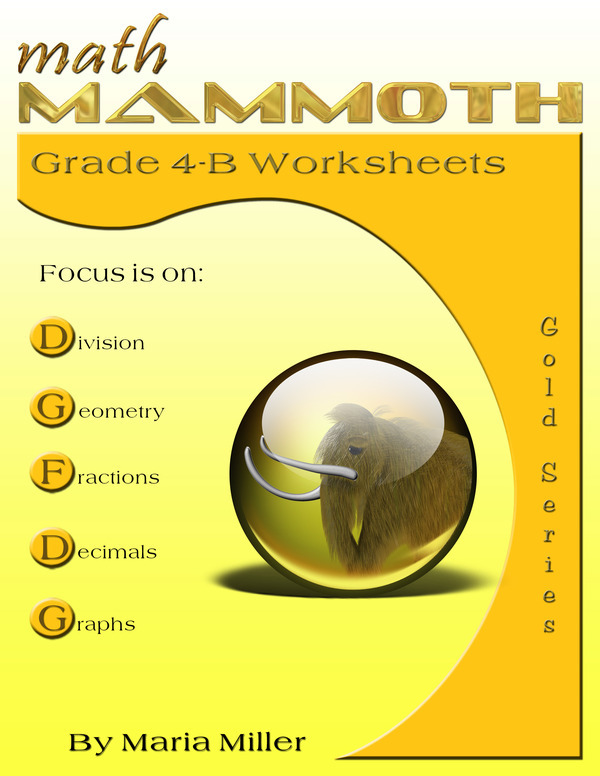 The book 4-B for the latter half of grade 4 has four sections: division, geometry, fractions, and statistics. There are some worksheets for division concept as a review from 3rd grade. Long division and the concept of remainder are in focus. Students fill in charts to study factors (divisors) of numbers between 0 and 100 (see the sample worksheet). In geometry, students learn about acute, obtuse, and right angles, how to classify triangles, about various polygons and how to draw them. They study congruent shapes and transformations (flip - turn - slide). Lastly, there are sheets for the area of rectangles and perimeter. Fraction topics are largely dealt with the help of visual models so as to encourage the conceptual understanding instead of a mechanical following of rules. There are worksheets for fractions and mixed numbers, adding/subtracting those, equivalent fractions, and comparing them. Decimals worksheets only deal with simple topics of tenths and hundredths, and adding or subtracting them. The last section has some probability and statistics problem sheets. On my other website, you can generate additional, free 4th grade math worksheets to supplement this book.